Mageplaza Advanced Reports for Magento 2 is an innovative module which helps online stores track, process and manages their business better with advanced customizable reports. Statistical data collected from customers, orders, sales, and products on a regular basis are quickly sorted out, providing a great help to store owners in both business and marketing decision-making. Magento 2 Advanced Reports extension by Mageplaza comes with two new reports which are not supported by Magento default: Sale by location report and Repeat customer rate report. These reports play essential roles in understanding stores’ customers and managing regional sales. Moreover, figures can be reported in selected time, be compared with the previous period and be displayed as line charts. This makes data processing much easier and quicker. Online business can be unstable and risky. This is why e-store owners always have to keep an eye on every fluctuation, even the tiniest one. Thus, being able to get quick and continuous access to the store’s business statistics is a matter of the utmost importance. To keep your business healthy, statistical data should be collected from the store’s customers, revenues, products, and other aspects for store owners to gain a deep insight into their customers’ behaviors, thus being able to make accurate decisions as well as select more effective marketing strategies. One of the problems which Magento 2 vendors may encounter while trying to access and process these critical data is that the default reports are inadequate for advanced statistical analysis. Mageplaza Advanced Reports extension for Magento 2 will help you out by providing highly informative reports. 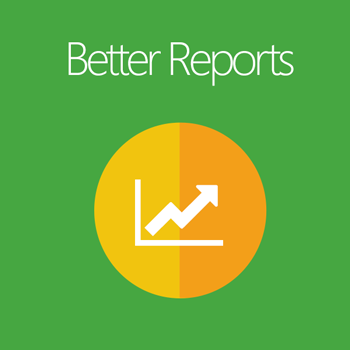 The advanced reports demonstrate figures in selected categories, compare and show changes in numbers on a well-arranged dashboard. Hence, store owners will be able to make the most out of their information. With Custom Range, admins are able to select specific time for the report and will not be limited to any range of time. With Custom Report Range, store admins can filter figures which belong to a specific period of time to compare with the initial ones. While the Sale by location report gives store owners an overview of sales in specific countries/regions, that of Repeat customer rate shows how your loyalty program is going in a visually comprehensible way.These statistical data are also ready to be compared with that of the previous period on a daily, monthly or even yearly basis. In standard version of Mageplaza Advanced reports extension; reports on repeat customer rate, transactions, total sales, average order value, tax, and shipping will be displayed as line charts. This helps store owners have a visual look at statistic data, making it easier to compare, follow and process. In every graph, the rates between numbers will also be shown with red standing for positive statistics and green indicating negative ones. Your store numbers and figures are rendered into reader-friendly line graphs with a nice interface, allowing better comprehension and management. Not only does the extension produces drawn charts, it provides comparisons between time periods as well. The results will be instantly displayed along with the graphs. With this module, the default report that comes with Magento 2 is improved with more in-depth examination of Revenue, Tax, Shipping and Quantity. As a Mageplaza product, Magento 2 Advanced Reports is designed to be compatible with our other extensions, for example Reward points, Gift card and Affiliate. If you have them installed and activated, their results will go into Advanced Reports as well, making gathering all the information you need much faster and easier. filter_drama Do Mageplaza provide a free version for this module? Yes, we do. Magento 2 Advanced Reports extension Standard version is free of charge. We still provide free 1-year support for this version. filter_drama What makes the advanced reports generated by this module different?? They are displayed as line graphs with details in figures and changes. Colors and numbers in the charts help store owners visualize about trends and statistical data more easily. filter_drama What’s new in Mageplaza Advanced Reports extension? Mageplaza Advanced Reports extension collects and shows the figures of sale by location and repeat customers rate. filter_drama How can I see the trends/changes in figures? You can compare figures with that of previous periods such as previous month, year or even previous custom range. Refer this for more info. Mageplaza Reports includes three packages: Standard, Professional, and Ultimate. Let's take a glance at the comparison table. Reports is a great way to visualize your sales, orders, etc without running anything external for graphs. Works great on Magento 2.3.1. The only issue I've seen is flickering in the graphs on some browsers. Is there a good decision without reports? No. So this module is a perfect addon. Just install it and instantly get years of back data that you ware not aware of. Great plugin, dashboards and excellent reports. Keep up good work. I love this extension. I am using the free version of it. But I am satisfied with my requirements. I have tested on Magento 2.2.6 and it's super smooth. I am a big fan of Mageplaza. Magento 2 Advanced Reports extension will help you to get the rich look and feel dashboard. I am using on Magento version 2.2.6 and it's compatible well. I will recommend to everyone. At the moment, you need to have a closer idea about your sales and taxes, you will need to install most extensions for that. This is a really great service from the support team, they will keep assist you until you reach your purpose. I'm really looking forward to some new features in this version. This is a great free module. It includes nice and helpful charts with some analytics that is very good for a beginner. I had one issue with lifetime sales figures, but it was immediately fixed by the support team, many thanks for that! The extension works great but the bigger highlight is their support team. I can't say enough good things about how they stand behind their product. This module is very simple to configure and use. I had some compatibility issues but the support team fixed everything in less than no time. Reporting and analytics is an awesome tool, this is a solution every store owner should definitely have! To be honest, I was kind of confused to install and control this extension at the beginning so I asked them for some help and got replied back very quickly and fully, good job guys. This is the second time I installed a product of Mageplaza and it works extremely well, helps me a lot in analyzing and sum up all the data and figures over any period of time in the specific region.